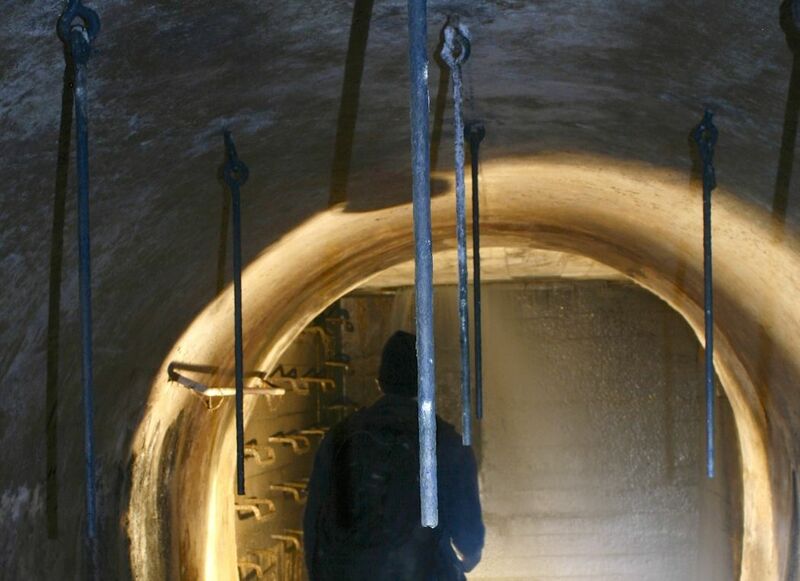 Dangling metal bars inside the Pie IX Collector Sewer. One thing that’s been bugging me for the past couple of years is what purpose these suspended metal poles serve. They’re always found close to the top edge of a dropshaft that’s six or more feet in height. Sometimes there are just one or two, or in the case of the sewer I was in last night, sometimes there’s a large batch of them. They’re always the same width and made with the same material. There are also eyelets at both ends of the pole: a large one at the top that fits through the fixture in the ceiling and a smaller one at the bottom. 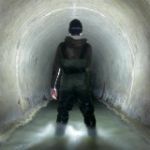 Both the old and more recently built sewer systems in Montreal have them. Tell-tales suspended inside the Cote-St-Paul collector sewer. I once came across some blueprints from the City which referred to these poles as “tell-tales” but that doesn’t really “tell” me anything at all. They’re fairly light and swing back and forth easily if pushed. They’re not robust enough to serve as safety features, though they do come in handy for hanging onto if ever you want to step out close to the edge. A chain or an actual railing would be much more practical if that’s what they were supposed to be used for. They also don’t seem to be there to measure flow rates or water levels. The trash that accumulates on them gives some indication as to how high things might have been in the past, but wouldn’t provide the degree of accuracy to satisfy hydraulic engineers. I know that tell-tales are used in sailing to help gauge wind direction and speed. I suppose that if there was a large enough air disturbance in the sewer, these poles might start start moving a little. Water falling down a dropshaft can definitely cause changes in air pressure which can often lead to problems, but I’d be surprised if the poles were hung up to indicate that. I mean, it also seems like a pretty low-rent way of doing it. Anyone else out there have any ideas? Please don’t make me call the City’s Public Works department to get an answer for this one. You’re my only hope. Works for me! Thanks, Rich. They really do look like a crude safety mechanism to tie off on. Yeah, I doubt they’d support the weight of a person. I certainly wouldn’t trust the anchors in the ceiling. Some of the poles are also right at the edge so tying off there wouldn’t exactly help keep you from falling down into the pit below. Perhaps they’re there to hang instruments to when needed? Like flow-monitors or some sort of lighting while work is being performed? Two railroad telltales have been left on the Lachine Canal bike path, on each side of the tunnel that goes under the CN line, just west of the Atwater market. At that spot, the bike path goes along the old CP roadbed. This has also been bugging me from ages (ever since seeing them in Skin of a Lion).. I think the plausibility of them being something to tie off onto might be overshadowed by the fact they’re approaching 70-80 years old. I just can’t accept your friend’s answer, the more I think about it.